Bhimrao’s Brahmin school teacher was so impressed with his capabilities that he gave him his surname of Ambedkar. On August 14, 1931, Bhimrao Ambedkar went to meet Gandhi with his lieutenants. This was just before the second Round Table Conference, one of three such conferences organised by the British government to discuss constitutional reforms in India. The biographer Dhananjay Keer writes that in the characteristic manner Gandhi observed in dealing with “non-Muslim and non-European leaders and representatives”, he did not look up at Ambedkar, and continued his conversation with Madeleine Slade (Mirabehn, his disciple) and others. They then had an intense conversation, which commenced with Gandhi reminding Ambedkar that, “I have been thinking over the problem of Untouchables ever since my school days – when you were not even born”. Ambedkar went on to question the sincerity of the Congress and Gandhi regarding the removal of untouchability in India. With his typical candour, he said: “Let me be brutally frank about it. History tells us that Mahatmas, like fleeting phantoms, raise dust, but raise no [body’s?] level”. His face flushed, he looked directly at Gandhi and said, not dispensing with courtesy, “Gandhiji, I have no homeland”. This statement of being aniket – homeless, yet belonging in the world – lies at the heart of Ambedkar’s existential philosophy. He could have added, “Gandhiji, I have no identity”. Gandhi’s personal secretary Mahadev Desai noted in his diary that Gandhi had no idea that Ambedkar was a “Harijan”, a term Gandhi used to refer to the so-called untouchables. Till Gandhi and Ambedkar departed for the Round Table Conference in London, Gandhi thought that Ambedkar was just a Brahmin interested in the cause of untouchables, which accounted for his intransigent and intemperate speech. Gandhi’s misrecognition of individuals and the complex social realities of India had been in evidence earlier in his meeting with the philosopher and social reformer Sri Narayana Guru in Kerala in the 1920s. The guru had been unimpressed by Gandhi’s abstract and anodyne propositions, which displayed little knowledge of Kerala. However, what is important in these encounters is the underlying fact of power: the patrician Gandhi did not need to know about his interlocutors. This fact should haunt those of us who invoke Ambedkar’s name. For we too are complicit in a forgetting. Bhimrao Ambedkar was born to Ramji Sakpal and Bhimabai as the youngest of 14 children (of whom only six survived). Sakpal was the family name, and Bhimrao Sakpal would have been the natural choice for his full name. Bhim, however, drew his surname from Ambavade, his ancestral village. Hence, his last name was Ambavadekar according to Maharashtrian custom. However, while he was at school, his Brahmin teacher was so impressed with the young boy’s capabilities that he gave to Bhim his own surname: Ambedkar. While BR Ambedkar remembered his teacher with gratitude and stayed in touch with him in his mature years, we still have to reckon with the irony of India’s foremost untouchable intellectual and activist bearing a Brahmin name. There are other facts. Every schoolchild in India is aware of Gandhi’s humiliation at Pietermaritzburg, in South Africa, where he was thrown out of a railway carriage despite possessing a first-class ticket. This one incident is seen as the springboard that catapulted Gandhi towards a politics of identity and integrity. 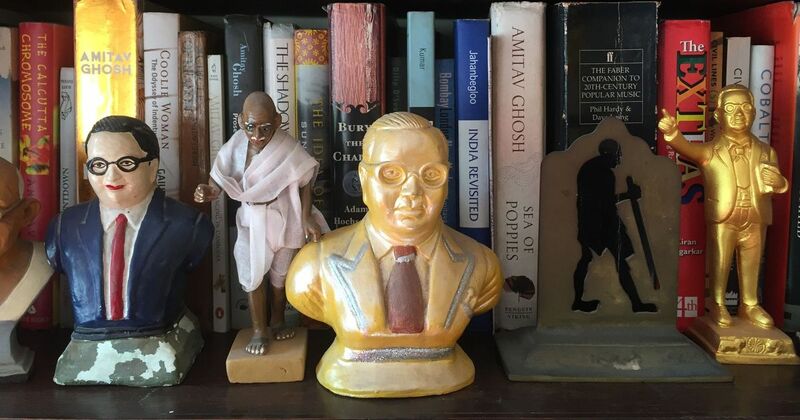 Ambedkar’s, on the other hand, was a life of humiliation. Early photographs of Ambedkar show him sporting a ragged, uncontrollable mop of hair – untouchable hair that no barber would deign to cut. His sister had to cut it for him, giving the young bespectacled Ambedkar the look of a mad scientist. When he returned from England, he was one of the most highly educated Indians of his time. But he found no one willing to take him in, or respect him, as subordinate clerks tossed files his way fearing ritual pollution. He married in a bicycle shed in Byculla, Mumbai. One half of that shed was used for the ceremony. He and his new wife slept in the other half. While Gandhi flirted with death – indeed, none of his strategic fasts were premised on his dying, Ambedkar wrote, aware of the fact that imminent death was the existential condition of an untouchable. This included death for transgressions, and death arising from social and economic deprivation. His opposition to the death penalty in the Constituent Assembly debates arose from the fact that untouchables in India lived under the shadow of extrajudicial murder. To be a Dalit was to be a broken man in all senses: to not have the certainty of life, to not have a homeland, to not have one’s own name.